Year 2013 promises to be another banner year for Jordan Brand as they are expected to release new models that are expected to impress and retros that are tipped to make waves like how they did before. 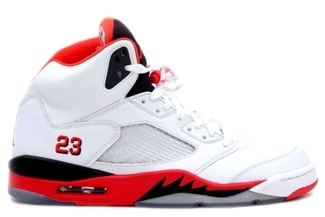 One good example is Air Jordan 5 “Fire Red”, which is set to make a comeback next year. This kick is different from the White/Black-Fire Red because of the reversal of black and red tones on the sole of the kick, making it be known as the White/Fire Red-Black colorway of the shoe. Reports suggest that this one will be release January next year so stay tuned and we will definitely keep you updated!